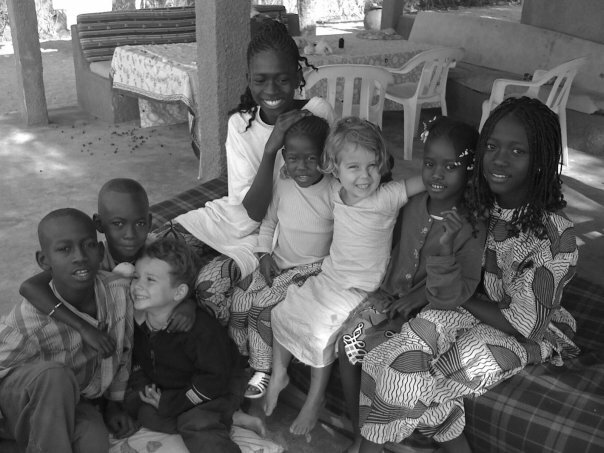 Over a particularly good bottle of red wine, on a balmy summer evening in 2008, my husband and I made a decision that would forever change our lives: to put our belongings in storage and move to Senegal, W. Africa with our two children, then three and four. We would give ourselves six months to build an earth house, using only local materials and labor. We would plant an organic garden, dig a well, live without electricity and use a composting toilet. We would make our own mud bricks and participate in the rammed earth construction of our house. We would fish, cook over a small gas stove and wash and hang our own laundry to dry in the sun. We would do all of this with a budget equivalent to what we typically spent in two months of living “the good life” we had cultivated in the states! Who the hell DOES that kind of thing? And WHY? I found myself answering these questions (or trying to) a lot over the months leading up to our departure. The main reason behind the decision was this: we wanted to prove that building and living sustainably was not just for the wealthy. Conversly, Earth building in developing countries in Africa is associated with the stigma of poverty.Our goal was to answer both of these dilemnas by building an affordable earth house that was both highly functional and beautiful. But we couldn’t afford to build this house in the U.S. due to strict building and lending codes.We had purchased land in Senegal two years prior (my husband is french and had visited several times) and decided it would be the perfect place to play in the mud. But there was a deeper truth that was harder to explain. We had finally realized the American Dream: we had a beautiful house, two cars and a home business in design. We had several credit cards and modern appliances that made our lives easy. Our children were accepted into a good pre-school. From the outside looking in, we had it all. And yet. And yet we were unhappy. Nothing in our life was really ours. The house was mortgaged, the cars were leased and our basic monthly expenses were proof that we were living beyond our means. We ate organic foods purchased with credit cards at expensive, corporate markets. The list goes on, but it all amounted to an illusion, one that was becoming harder to ignore. I didn’t fully know the why or the how of our decision. In fact, I was terrified of all the unknowns and what-ifs. I only knew that it was something we needed to try. A mounting itch that needed to be scratched. So on December 15th, 2008, we boarded a plane to Africa for that six month life sabbatical. It’s now been six years. Six Years full of joys, setbacks, cultural shock and then immersion, loss, trial, failure and finally balance. We live in the earth house we built together and produce our own power using the gifts of the sun and the wind. We live bill-free with the exception of internet, have surrendered the notion of credit and embraced the barter system for many of our food purchases. Our children are joyous participants in the school of life and freedom. My husband now has a successful business designing ecological earth homes in the private and communal sectors. As for me, I like to cook for the people I love and I love to eat what we grow! And I marvel every day at how much I learn from our children. I also love to write. So I hope you like to read. And I hope I’ve shared something here which you can carry away with you. I’d love to hear from you. You can either send me an email through the contact form or leave a comment on this page.